Is Emergency First Aid Important? Posted on 25th February 2019 at 7:46 pm. In many ways, emergency first aid couldn’t be more important. Emergency first aid is the first line of treatment in any situation involving an accident, injury or sudden illness. It can stop a minor incident turning into a major one, it can prevent further damage through injuries and it can even save lives. Why do we need emergency first aiders? The world is a dangerous place, and accidents and injuries can happen to any one of us at any time. Unless you live or work right next to a hospital with an accident and emergency department, then it will take time for trained paramedics or ambulance teams to get to you to provide care. Without emergency first aiders, victims may do themselves further harm, they may lose dangerous amounts of blood or they may even die from their injuries. Emergency first aiders can prevent this from happening by applying simple, basic skills on the spot. What does an emergency first aider do? The aim of emergency first aid is to deliver essential treatment as a first responder. They will usually be the first on the scene, or in a workplace or school they will be the first person called for when an incident takes place. The role of an emergency first aider is to do what they can to protect victims and provide basic treatment until the emergency services arrive and are able to take over. This can range from providing comfort and reassurance to prevent patients going into shock, to using a tourniquet or applying pressure in order to stop bleeding. An emergency first aider will also have the necessary training and skills to take charge of a situation and instruct others on how to assist victims appropriately, where they otherwise might not know what to do. It is no exaggeration to say that emergency first aiders save lives. 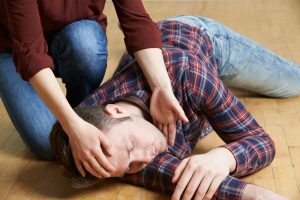 Procedures such as cardio-pulmonary resuscitation (CPR), clearing of the airways in choking victims, or even the use of an Automated Emergency Defibrillator (AED) can make a vital difference when time is short. If the victim has to wait for a paramedic or other medical professional to perform such procedures, then they may not receive the help they need in time. Emergency first aiders are also taught to recognise the early stages of major illnesses, so that they can provide appropriate help and alert medical professionals promptly. Emergency first aid training is important because you never know when you will be called upon to help. You could be in a road traffic accident tomorrow, or you could be faced with the victim of a mugging or violent attack. It is important to have the skills ready to help, so that you can make a difference when you are needed, rather than hoping someone else will step up. We all hope that there will be someone with first aid skills available to help us when we are in need, so it is important that we learn those skills ourselves in order to be able to help others.